Anna University Higher Semester Paper Valuation Completed Successfully. Most of the Zones paper valuation is completed by yesterday and very few zones completed by today. The next works like Dummy Number to original number matching, mark database entry work will start soon. This time, it is expected to published the result earlier by Anna university. Paper Valuation Process is going fast. But, this time also its not so liberal correction. Very few Pass on most of the bundles. 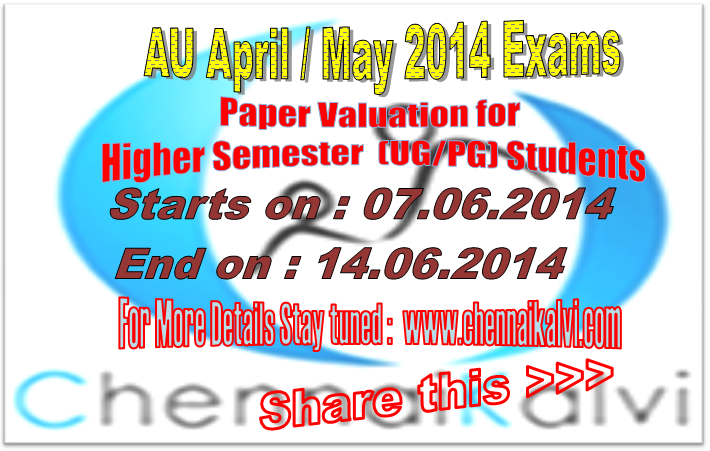 Paper Valuation for April / May 2014 Higher Semester UG / PG Examinations are started. This time in paper valuation the Tabulators are not included (it may be for reducing the cost of valuation). That means no separate persons are allotted for Totaling the Marks in each papers. Reducing the cost may affect the quality of result. So, it is expected more (Positive / Negative) Total Mistakes on the results. Anna University Higher Semester Exams are almost over and the Paper valuation is started very shortly. This time Anna University decided to published the result very soon. So, the Paper valuation is expected to completed within a single phase. The Higher Semester (2nd Year, 3 Year and Arrear Papers) papers valuations are started by this week end and and it will be completed before the next week end. The Paper Valuation for Higher Semester is starts on 07.06.2014 and it will be end with 14.06.2014. If the all papers are not able to completed within 14.06.2014, then the date may be extended or Second Phase of Paper Valuation date will be announced later. For More Updates, Keep watching this page... & Share this Page with your friends.